Directions: Derrylahan Independent Hostel is located on the Coast Road half way between Kilcar and Carrick on the west coast of Donegal. Less than 10 minutes drive to Sliabh Liag (Slieve League) sea cliffs. Hostellers have been disappointed to end up in other hostels when looking for Derrylahan - be sure to arrive at the Derrylahan Hostel. Click here to download detailed directions (pdf-file). When travelling to Derrylahan Hostel by car or by bike you must come down through the village of Kilcar and take the coast road at the bottom of the village. From there follow our signs. If you are travelling by bus then ask the driver to be dropped of at The Rock, Kilcar. The hostel is less than a mile from there. 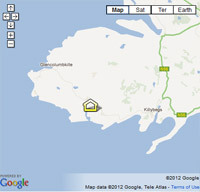 When in Kilcar or Carrick you can also phone the hostel to be picked up. (074) 9546150 or call the hostel for local bus timetable (074) 9738079.